Please join us for an information candidate meeting on April 29, 2019 at 7:00 PM at the Montrose Community Center! The Montrose Royal Ambassador organization offers young women a unique experience of growth, volunteer and educational experiences that focuses on leadership and the opportunity to serve as positive role models. The Montrose Royal Ambassador program is dedicated to the development of a scholarship opportunity and to fostering networks and friendships within the community and businesses of Montrose as well as the surrounding communities. Two candidates will be named Montrose Royal Ambassadors; both equal in title and reign. The Montrose Royal Ambassadors will wear the same attire and hair style to any and every public event. Their sashes and crowns will both be identical. Each Ambassador and their parents will sign The Montrose Royal Ambassador Contract in the presence of The Montrose Royalty Committee after being crowned. During their reign, the young ladies will be required to attend various community events and fundraisers for community organizations. The Montrose Royal Ambassadors are required to appear at all parades, banquets and coronations in Wright County as well as The Minneapolis Aquatennial. The attendance of festivals outside of Wright County is at the discretion of The Montrose Royal Ambassadors and their families. One Montrose Royal Ambassador will represent the City of Montrose as an Aquatennial Queen of the Lakes Candidate, and will be announced at the end of her reign. This candidate will assume the title of Aquatennial Representative until she attends The Minneapolis Aquatennial the following year. Occasionally, the Aquatennial Representative will be asked to attend various events within the community. Entry requirements for the Minneapolis Aquatennial can be found at: http://www.aquatennialambassadors.com. All candidates must be between the age of 17 and 20 by July 1 of the festival year she competes. A candidate must live in Montrose or be affiliated with Montrose through church, school or volunteerism. All candidates must be present for Judging Dinner and the Montrose Days Parade and Coronation. Candidates must agree that they have not been, are not presently, and will not become married or pregnant, nor will cohabitate during the year of reign if selected as Montrose Royal Ambassador. By becoming a Montrose Royal Ambassador Candidate, you have accepted the responsibility of representing the City of Montrose with great pride, dignity, and tact. You agree that you will act with respect and order at all times. You agree that you will not speak unkindly or inappropriately about, or to a fellow candidate or Ambassador. You agree to attend the required events and will give the committee notice of scheduling conflicts. Whenever a candidate is wearing her candidate attire, she is to be chaperoned by parent, royal parent, or by a committee member. No candidate will travel without a chaperone, nor leave the group. Consumption of alcoholic beverages, smoking, or the use of illegal drugs is not permitted at any time as a candidate or ambassador, and will result in immediate disqualification or removal of title. No visible tattoos, facial or body piercings. Limit of two earrings per ear at events. Boyfriends are not allowed to travel with the group, or allowed at events with candidates. They may attend as a spectator. Hand holding, kissing or showing of affection is not permitted at any time during events or when in candidate attire. Cell phones should be used discreetly; please leave your phone in your car, put it in your bag, or give it to your chaperone. Candidates will be given a t-shirt and sash. When specified, the candidate will wear her candidate t-shirt with khaki or black capris with her sash. Business attire with candidate sash is required at the Judging Dinner. A floor length pre-approved formal dress is required for The Montrose Royal Brunch, Parade, and Coronation. All chaperones are expected to be presentable in a manner that also represents the City of Montrose. Chaperones will ask a committee member if they are unsure about their or their candidate’s attire. Each candidate must be sponsored by a minimum of one sponsor and submit the sponsorship form and fee of $200 by June 1, 2018. If a candidate is unable to provide a sponsor, a Montrose Royalty Committee member will assist in finding one. Please see the Candidate Sponsorship page for more information. If you choose to resign as a candidate you are responsible for telling your sponsor and the royalty committee. Candidates will always wear khaki or black capris, candidate t-shirt and sash to parades, unless otherwise specified. Candidates will socialize with other Royalty and parade participants during the line-up, letting others know about the great City of Montrose. Candidates must be seated with their ankles crossed and tucked to the side while the float is in motion. Verbal rapport with the parade spectators should be minimal, no shouting is allowed from the float at any time. Candidates should bring a snack and plenty of water to the parade. Though no food is allowed on the float during the parade, candidates should always keep water nearby. Candidates are required to attend at least two coronations. There is no talking during the coronation, though occasional whispers are fine. Congratulate the newly crowned royalty. 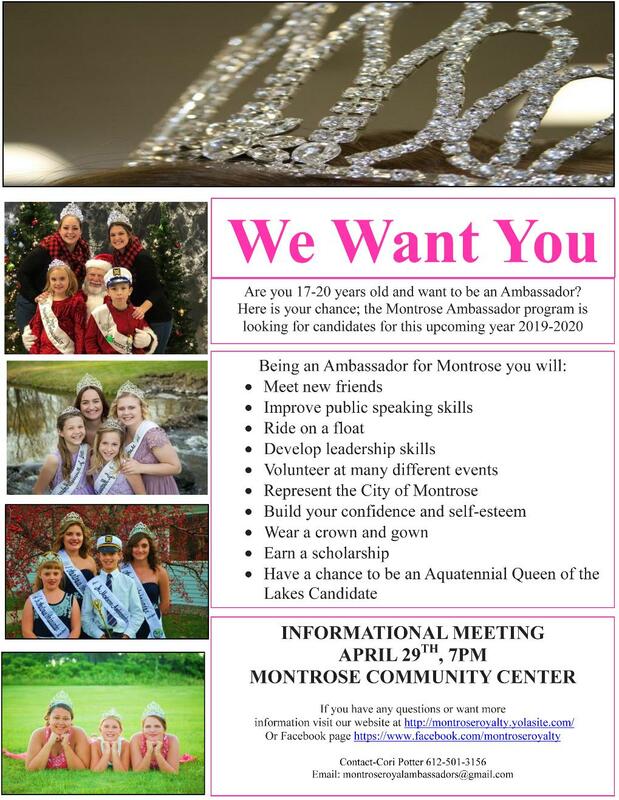 Please download and view the MONTROSE ROYAL AMBASSADOR CANDIDATE PACKET for all guidelines, schedules and a candidate application.